Introducing a new album of the music of Debussy and Ravel by the internationally renowned concert pianist Alessandro Taverna. Featuring Debussy's Images, Book I & II, L'Isle Joyeuse and Ravel's Jeux d'eau, Gaspard de la nuit, and La Valse. The latter two pieces were both recorded live during a recital on 16th January 2016 at the Turner Sims Concert Hall, Southampton. The Guardian’s was one of many warm reviews received for Alessandro Taverna’s debut disc on SOMM. 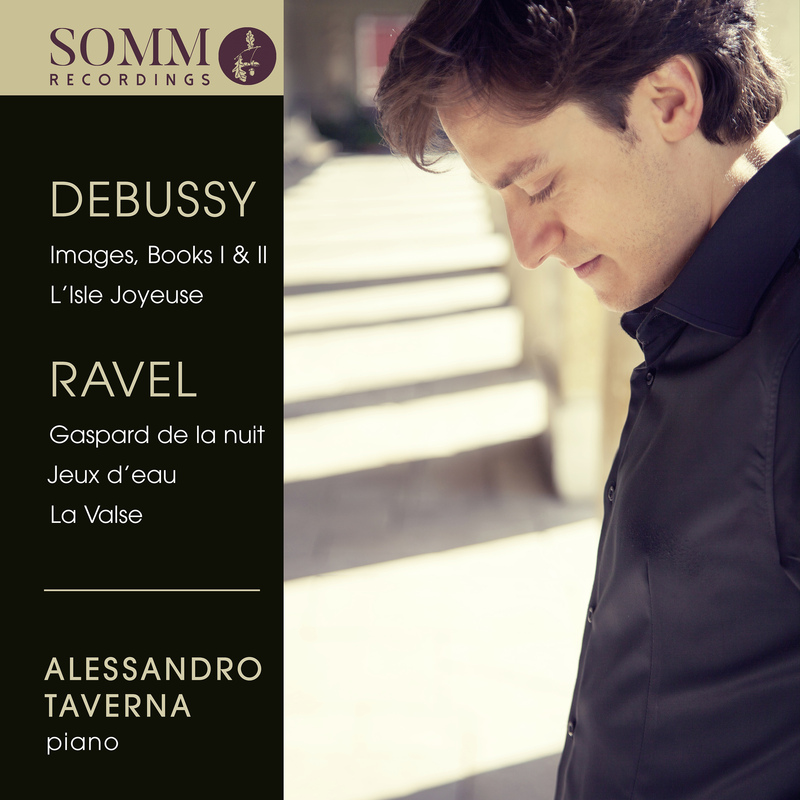 His playing on this second disc attests to Taverna’s close affinity to the music of Debussy and Ravel. He possesses a mesmerising palette of colours ranging from a seductive, ethereal touch in Ondine to ferocity and thrust in Scarbo — and what great brilliance and dynamism he brings to La Valse and l’isle Joyeuse! In addition to winning Bronze Medal in the Leeds International Piano Competition, Alessandro Taverna has established his international career by winning top prizes at Minnesota Piano-e-Competition, London International Piano Competition and Busoni Piano Competition in Bolzano. Since then he has gone on to perform in some of the most important concert halls and seasons including Teatro alla Scala Milan, Musikverein Vienna, Berlin Konzerthaus, Munich Gasteig, Wigmore Hall and Royal Festival Hall in London, Bridgewater Hall Manchester, Salle Cortot in Paris, Philharmonic Hall Liverpool, Castleton Festival, Musashino Hall in Tokyo, Auditorium Parco della Musica Rome. His success has led to many engagements with the most prestigious orchestras including Filarmonica della Scala, Münchner Philharmoniker, Royal Philharmonic Orchestra, Minnesota Orchestra, Royal Liverpool Philharmonic, Bournemouth Symphony, Bucharest Philharmonic, Scottish Chamber, Orchestra of the Accademia Teatro alla Scala, Philharmonic Orchestra of Bergamo and Brescia Festival, working with conductors such as Lorin Maazel, Riccardo Chailly, Fabio Luisi, Daniel Harding, Michele Mariotti, Reinhard Goebel, Thierry Fischer, Michael Guttman, Pier Carlo Orizio. For his artistic achievements and his international career, in 2012 he was awarded the Premio Presidente della Repubblica by Italian State President Giorgio Napolitano. A documentary on his life was shown on BBC4. He has also recorded for BBC Radio 3, Rai Radio 3, Slovenian National Radio and Television, RSI Swiss Radiotelevision.